Tampa Bay’s largest golf equipment expo returns to Tampa Bay Downs on February 23 and 24! 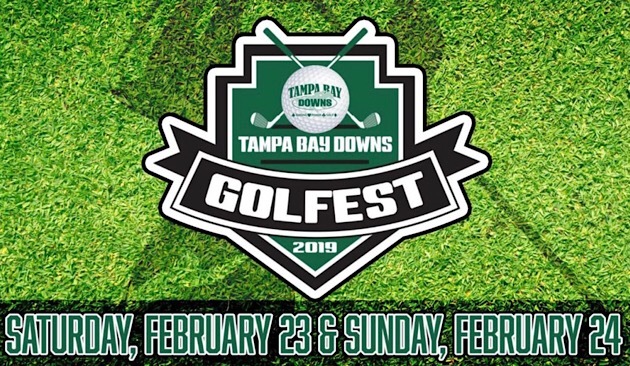 Golfest 2019 - Tampa Bay's Largest Demo Day & Golf Expo returns for its ninth year of showcasing the latest golf technology and helping golfers of all abilities save some strokes off their game. While golf season never really ends in Florida, Golfest comes along at a perfect time for anyone visiting Tampa to get away from the cold winters back home. It’s easy for any snowbird player to try out some new clubs and take it back with them when their home course opens for the season. Golfest is also a fantastic family event — with tickets just $10 for adults, kids 14 and under admitted free, and free parking, you can bring everyone to The Downs Golf Practice Facility for the day. You even get a free small bucket of golf balls with your $10 ticket purchase! During Golfest at Tampa Bay Downs, you can “try and buy” the latest equipment from some of the biggest manufacturers in golf. Whether you want to take a few quick practice swings with a new club, or try it out on the Golf Practice Facility’s driving range, chipping area, or putting green, Golfest lets you find your new perfect golf club. You can also get your current clubs refitted, or if it’s time to upgrade your entire set, you’ll have the opportunity to trade in your old clubs using Golf Club Dealz. After they give you a price for your outdated equipment, you can use the money to trade it in for new ones right on the spot. RELATED CONTENT: Great Events at Tampa Bay Downs Featuring Golffest and Craft beers! At the Tampa Golfest event, you’ll be able to visit a local small business and golf course expo, with over 20 representatives from all over Tampa Bay. You can get free lessons on site, play some miniature golf with your kids, or head over to the Celebrity Stage for some insights, tips, and entertainment from guest speakers all weekend long. In addition, the golf team from nearby Sickles High School will hold a silent auction where you can bid on rounds of golf, memorabilia, gift baskets, and much more. ”OK, this is all great,” you’re saying, “but how do I win stuff?” You can take part in putting and chipping contests all weekend, or enter Golfest’s “Golf Ball” drawing where you can win your share of over $5,000 in prizes! Golfest 2019 runs from 9:00 a.m. to 4:00 p.m. on Saturday, February 23, and 9:00 a.m. to 3:00 p.m. on Sunday, February 24. Get your golf season in gear by visiting Golfest at Tampa Bay Downs! Looking for more news about recreational activities in Tampa? How about new and exciting things to do in town? Visit 813area to learn about everything going on around Tampa. Make sure to sign up for free email updates. Logo from 813area event page.